The Mediterranean region is one of the most sensitive and vulnerable social, cultural and environmental hotspots on the planet. Yet current economic practices and policies primarily follow conventional development models that result in depletion of natural resources and externalization of negative impacts. Unlike these traditional economic models, Green Economy (GE) promotes a more inclusive and environmentally friendly development at global and local scale, that recognises the economic value of our natural capital and the associated goods and services, while internalising negative impacts and costs. If correctly applied to the complex and unique Mediterranean context, this approach can lead to a balanced economic development within the ecological limits of the region, while reducing social inequalities and improving quality of life throughout. The Green Economy in the Mediterranean is project funded by MAVA Foundation for nature and implemented by ECO-UNION, MIO-ECSDE and GREEN ECONOMY COALITION. 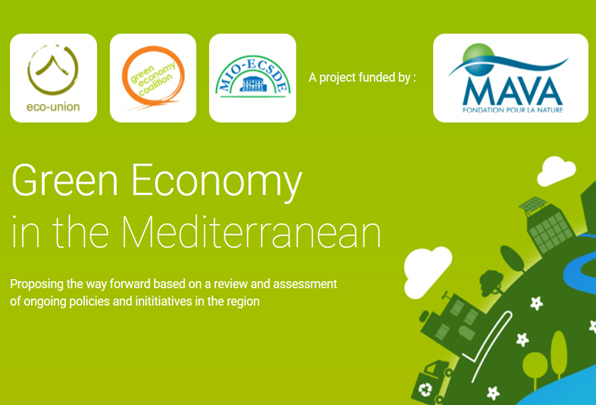 This project reviews and assesses ongoing green economy policies and initiatives in almost all Mediterranean countries and at the regional level. propose steps forward for a successful implementation of green economy in the region. The project methodology is based on the collection of primary and secondary data, including a survey reaching out to major stakeholders to capture perceptions and views related to Green Economy, and an in-depth analysis. All key findings and ways forward −results of the in-depth analysis− will be compiled into a report entitled “The State of Green Economy in the Mediterranean”. An environmental non-profit association working to accelerate the transition towards sustainability in the Mediterranean region. The federation of Mediterranean Non-Governmental Organizations working on environment and development. A global network of organisations committed to accelerating a transition to a new green inclusive economy. A philanthropic foundation with a focus on the conservation of biodiversity.